Avira Antivirus is a program that has long been regarded as one of the best antivirus applications around. This is due to its top notch virus detection and also the fact it does not slow down your computer too much. Currently there are 5 derivatives available for home users which are the free version, Antivirus Suite, Family Protection Suite, Internet Security Suite and the Ultimate Protection Suite. The paid versions now include extra features such as cloud storage, parental controls and system maintenance/tune up tools. A few years ago, Avira Free Antivirus took first place with the most downloads at CNET’s Download.com for the antivirus category. Sadly their ranking has dropped significantly and they now get around 1/25th of the downloads the likes of their main competitors AVG or Avast get. Avira did not get too bloated and it’s detection is still great, so what went wrong? 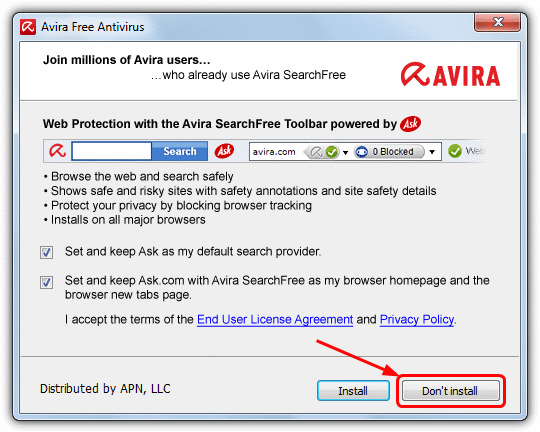 Avira actually annoyed many of its faithful users by embedding an unnecessary toolbar called SearchFree provided by Ask.com, and some people regard the Ask toolbar as adware. We wouldn’t necessarily classify the Ask.com toolbar as adware although it is still one of the most unpopular browser toolbar add-ons around. This is because uninstalling it from the Control Panel will fully remove the toolbar including restoring the preferred search engines and default homepage in web browsers, as opposed to something like the Babylon Toolbar which leaves all manner of things behind when you try to uninstall it. Other than just bundling the toolbar in Avira, opting out of the toolbar during installation or uninstalling it from Control Panel afterwards will disable the Web Protection component that scans every URL that you visit from your web browser and blocks them if malicious code is found. That’s an important component of the antivirus disabled because web threats are more common now than ever. 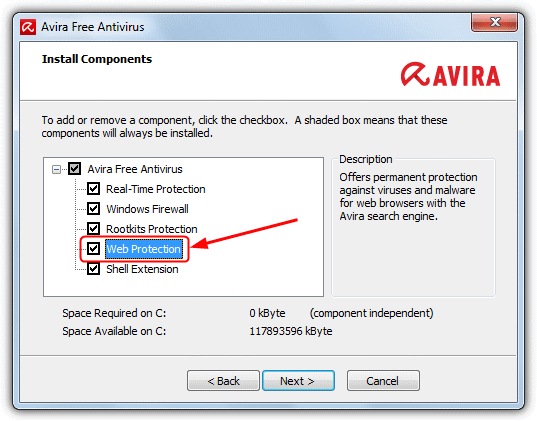 If you’d like to continue using the Avira Free Antivirus and keep the Web Protection enabled without installing the SearchFree Ask.com toolbar, here is an updated trick to work with the latest Avira 2014 v14 on both 32-bit and 64-bit Windows systems. To try and make things a bit easier, we’ve provided help for 3 different scenarios. For those of you wanting to install Avira for the first time but don’t want the toolbar installed from the off, this is the solution you need to follow. 1. Download the registry fix file below according to your Windows version (32-bit or 64-bit) and run it to merge into your registry. If you are unsure which one to download, installing both registry fixes won’t cause any problems on your computer. 2. Download the latest version of Avira Free Antivirus 2014. 3. Once the download is complete, run the setup file. In the Installation Type window, make sure to select Custom, then tick the agreement box and click Next. 4. Continue with the installation until you reach the window offering the install of the SearchFree Toolbar and changing your default search and homepage options. Simply click “Don’t install” to continue without installing the toolbar. The search and start page options don’t need touching as they will only change if you select Install. 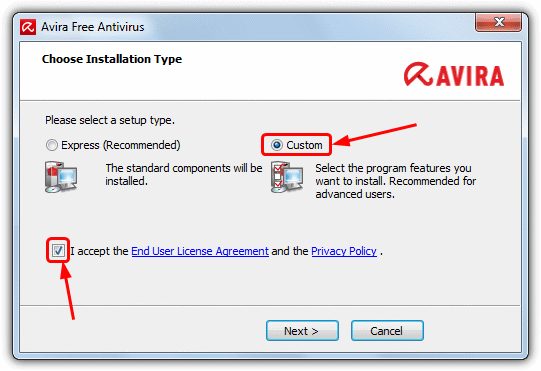 The installation will then continue, don’t install simply chooses not to install the toolbar and will not halt the Avira main installation process. 5. After installation and the updating has finished, run the Avira Control Center shortcut from the desktop or tray and you’ll notice that the Web Protection is activated. You can even access the Web Protection options from the configuration button. Many users will have installed Avira Free Antivirus and also installed the SearchFree toolbar either by mistake or because they were prepared to tolerate it as they are still getting what is essentially a good free antivirus. This solution is for those with Avira and the toolbar currently installed, and should also work if you have upgraded from a previous version and the toolbar was installed during the upgrade. 1. 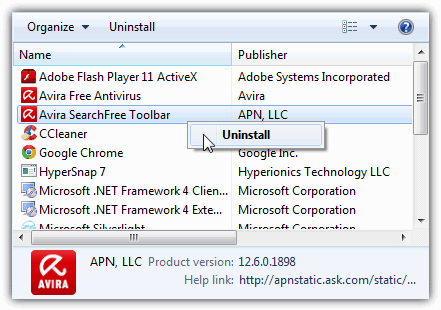 Open Control Panel -> Programs and Features (or Add and Remove Programs for XP) and uninstall the “Avira SearchFree Toolbar”. Leave the Programs and Features or Add and Remove window open as you will need it again in a moment. After the uninstall you will now find the Web Protection component inside Avira has been disabled and greyed out. 2. Download the registry file for your operating system from and run it to merge the data into your registry, these are the same files as above. 3. 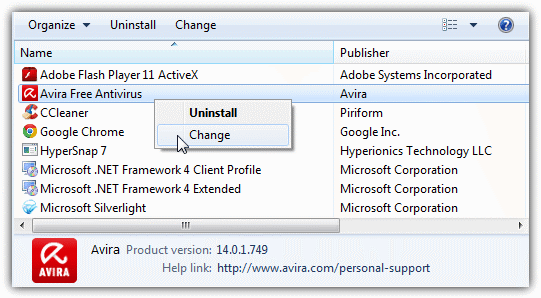 Go back to the Programs and Features or Add and Remove window, right click on the Avira Free Antivirus entry and select Change. In the window that pops up make sure Modify is selected and click Next. 4. In the Install Components window, tick Web Protection and then click Next. This will reinstall Web Protection again after it was disabled when the toolbar uninstalled. 5. Go into Avira and you will see Web Protection has been enabled again but now you don’t have the toolbar installed. If you’re running Avira free but without the Web Protection feature and would like to know how to enable it while not having to install the toolbar, this is for you. The procedure is very much the same as the method above but you don’t have the toolbar to start with. 1. Download the registry file for your computer and double click it to import the data into the registry. 2. Open Control Panel -> Programs and Features (or Add and Remove Programs for XP), right click on Avira Free Antivirus and click Change. 3. Making sure Modify is selected, click Next. Enable Web Protection by ticking the box and then click Next. Checking in Avira’s main window, you should see the Web Protection feature is now enabled. Hopefully you can now enjoy the free Web Protection feature by Avira Free Antivirus without upgrading to the paid versions or being forced to install the unnecessary SearchFree Toolbar provided by Ask.com. Judging by the huge drop off in numbers of people downloading Avira these days, we hope that one day they will realize just how unpopular the SearchFree toolbar is and users are voting with their feet by avoiding Avira totally. After all, there are plenty of other free antivirus products available that don’t have this restriction. Thank you very much. Helped and saved a lot of time! So, I’ve imported the reg and it allowed me to enable Web Protection, yet I see no indiciation of it running in my browser (Firefox). I’ve entered some suspicious sites to test it and nothing happened. Plus, when I try to change the settings (like “Block suspicious I-frames”) it doesn’t stick, the settings keep reverting back to default. Well, a Web Protection alert just popped up, so it seems everything is working fine, so disregard the first half of my comment above. it doesn´t work with Avira 15.0.8.656. Have you something to fix Avira 15 ? I’m running Antivir Free 15,0.9.504. I didn’t run the .reg file. Just looked at it and set the values up manually. (call me paranoid, but a little bit of paranoia never hurts). Followed the rest of the directions to change the install and it worked like a champ!!! Maybe you might want to look at the registry key HKEY_LOCAL_MACHINE\SOFTWARE\AskToolbar\Macro using regedit or regedt32. Drill down to the Macro key and verify you have a string named tb with a value of AVR-4. If you don’t that might be the problem (caveat, I’m an a 32 bit system. If you’ve got a 64 bit system the path is HKEY_LOCAL_MACHINE\SOFTWARE\Wow6432Node\AskToolbar\Macro). Maybe the reg entry didn’t get written when you executed the file. Worth checking. A tip of the hat to Raymond. Thanks for the tip man! Excellent. Today is July 27, 2014. I ran step 2 above and my installation says “Cloud Protection” instead of “Web Protection”. Is this the same? When I open Avira, my “Web Protection” shows not installed. All about web protection are gone, with version 14.0.5.450.
and thw full suite Avira Firewall…That’s it. Nice Tips, it’s work for me :) ……. thank you very much. Sorry, looks like Avira has found a way to bypass. Just tried it on Avira 14.0.2.286/Web Protection 14.00.02.254 and the fix works perfectly fine. Make sure you are following the instructions carefully for your situation. Hi Raymond, the reg fix doesn’t seem to work with Avira 14. I have never had Avira before. I ran the reg file before installing Avira 14, opt out of the toolbar during install. But still there is the Ask toolbar. Do you have the reg fix for Avira 14? Hi Raymond, Your fix was really what I was looking for. Just been using free avast that is also 100% effective because of its complete shields but got annoyed coz it slows down my comp. Gonna try avira now. first of thank you. one question is can i delete the downloaded registry file after importing it ? Yes you can delete the downloaded registry file after importing it. I download the web protection and it don’t work. I had to start all over uninstalling avira and started with web prot and then the avira you had listed but still didn’t work. I have version. 14.07.468 and it’s not listed at all in the change avira components. Please tell me what else to do or how to uninstall the web protec. Nice one! Like you say, the decision to force cruddy unwanted toolbars onto users is a strange decision for Avira to make. I’m sticking with it for now thanks to this fix, but if they try making life even more difficult for users in the future I’ll be joining the exodus to other AV providers…..
However,What happens when you want to disable the web protection or remove it.? Then the registry will need cleaning to remove the fix will it not?? Thanks it works, I wouldn’t mind the toolbar, if it was google, but I don’t use or like the results that ask provides. I am thankful you have provided a workaround that provides more security without requiring the toolbar that I don’t want, and will not use. Awesome! May 2013 and this still works! Didn’t even have to go in to enable real-life protection it was already there after I installed the registry. Thanks a bunch! Hi Raymond, me again. Sorted my problem. Your Avira bypass works just fine, thank you again. Hi Raymond, Re-installed Avira as above, all worked but now update downloads at only 27Kbs/sec continuously and doesn’t install new files. I wonder if when Avira scans for incompatible software before download it picks up your file and reacts? How can I find the red file and delete it? Is it really necessary to uninstall Avira first? Why can’t you just add the info to the registry and then enable web protection through the control panel? Sorry if I sound picky, but my Avira is pretty heavily configged and I REALLY don’t want to go through all of that again. Thanks for the fix in any case. Hi Jeff, yes you will need to uninstall Avira and then re-install for this registry fix to work. THANKS BRO , THIS IS WORKING GREAT , IF POSSIBLE I GONNA GIVE YOU GOLDEN GLOBE.. If merely there was significantly more sites like this one on the online world. Thank you Raymond, I succeeded at once and believe my PC is safe again ! my favourite xmas-gift… thank you so much, raymond! works like a charm. tested on w7 64bit, no chance to test 32bit yet, but sure it works as well. Thank You Raymond for sharing your wisdom. Do you have a tip to disable Avira advertising popup in v 2003.
thank you :) you are great. Where the hell would we be without Raymond. Welllllll …….. I’ve said it once and I’ll say it again Raymond – YOU ARE THE MAN ! Thank you very much for sharing that with us. The Ask toolbar might not be spyware/malware/virus but I consider it to be one of the most prolific pieces of utter crap out there. The only toolbar I want (aside from menu and navigation) is bookmarks. End of. My licence for AVG is about to run out and I was/still maybe, going back to Avira free because it is a good antivirus. It’s a shame they sullied it with this toolbar AND a nagging screen as well. Thanks for the work around Raymond. I’ll find out in about a month if it still works :). Thanks for wading through this and making a fix available. Thanks so much, I really wanted to keep Avira but most of all webguard.. THANK U SO MUCH FOR THAT!!! you’re again a god among mankind, big THX!